Pietro RUFFO (b. 1978) explores contemporary geo-political and philosophic themes through his work. Irhal, Irhal is Ruffo's third exhibition at Galleria Lorcan O'Neill Roma. The title is an Arabic expression that means "Away, Away". Ruffo, who has always been active in studying the complex behavioural thoughts surrounding fundamental themes like freedom, democracy and political identity; envisages a world geography in this exhibition, that is invaded by the deep aspirations for freedom that was expressed during the protests and manifestations that came about during the 2010-2011 winter, and that broke out in a chain of protests and riots in the Middle East region, the East and in North Africa. These new works create an imaginary world geography in which the different continents are revealed through the cartographic maps which Ruffo cuts, paints in vivid watercolours, assembles and configures into complex images. Single Arabic words extracted from slogans used by the protestors on the streets (democracy, tyranny, peace, blood etc.) are cut out, painted in gold leaf and placed in relief on the maps. Every word is framed and connected to the others through a geometric pattern deriving from the Islamic tiles in the Alhambra. The abstract geometric grid that incorporates these fragments; fervent and idealistic of revolution, symbolically connect regions and Western countries (Europe and the United States) with other countries who have totally diverse cultural and political social systems (Africa, Asia). This grid symbolises the new communication instruments; as during the protests, civil resistance is expressed during the protests, utilizing social networks to organise communication and divulge the events. The geometry in Islamic art is utilized in these works and are symbolic of connectivity. Every conceptual and material layer of each work creates a stratified and complex surface, with which the artist brings to light the problematic construction of collective identity and noted geopolitical borders. Such elements are even further evident and simplified by the artist in a communal object such as the world globe Icosaedro, on show in the gallery's corner space. A second spherical sculpture Electoral Globe is on show in the gallery; made of PVC, with graphite drawings on sheets of vetronite, similar to a big soap bubble, it comments on the period following the revolution. Every drawing reproduces in intricate detail the images shown on the electoral posters that invaded the streets of Egypt immediately following the outbreak of the Arab Spring, which gave rise to the country’s elections. An historic event interpreted by Ruffo with great energy and poetry. These new works, collectively dedicated to the ideals recently expressed in the Arab world, confront the difficult theme of the sources and connections between political aspirations in certain countries, and confirm the focus of Pietro Ruffo’s ethic-civil attitude. Pietro Ruffo studied architecture at the University of Rome, followed by a research fellowship at Columbia University, New York (2011). He has exhibited widely in Italy, including at the MACRO and MAXXI museums in Rome, and the museums in Pesaro and Prato. He has also shown in Berlin, Paris, Strasbourg, London, New York, and Moscow. In 2009 he was awarded the Premio Cairo; and in 2011 he won the New York Prize from the Italian Ministry of Foreign Affairs. 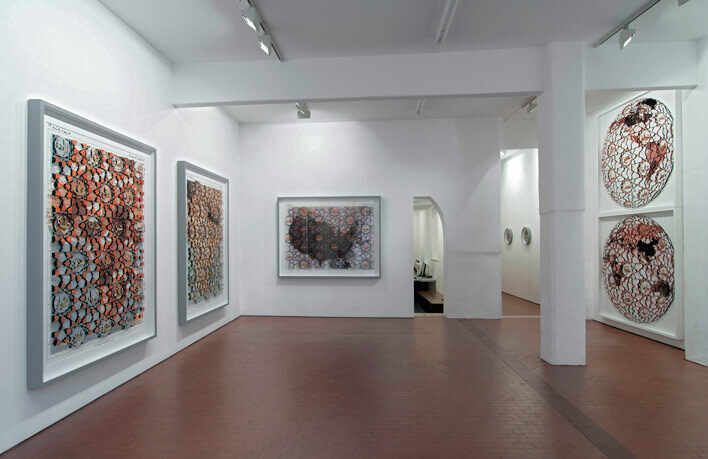 His artist residencies have included The International Studio and Curatorial Program, New York (2010), and the Nirox Foundation, South Africa (2012).